NEW YORK—The Jean-Pierre Ponnelle production of Rossini’s “L’Italiana in Algeri” (“The Italian Girl in Algiers”) has been a crowd pleaser at the Metropolitan Opera since 1973. With witty additions by stage director David Kneuss, and with Music Director Emeritus James Levine conducting and a fine cast, the opera still delights. Rossini’s 1813 opera deals with captivity and a rescue, but the resourceful title character is the one who wins freedom for herself and her lover. The setting is the seaside palace of the Bey (chieftain) Mustafà in Algiers in the early 19th century. His wife, Elvira, suspects that her husband’s affection for her has waned, and she turns out to be right. Like many rich and powerful men, he feels he is entitled to trade in his spouse for a newer model, even though he has a harem on the premises to keep him amused. Mustafà decides to marry his wife off to Lindoro, a young Italian man who had been captured by pirates. The ruler orders his henchman Haly to find an attractive Italian woman for him. Meanwhile, Lindoro’s lover, Isabella, is shipwrecked and falls into the clutches of Haly’s band of pirates. The Turks want to sell Isabella’s traveling companion, Taddeo, into slavery, but he talks them out of it by claiming he is her uncle. Actually, Taddeo wants Isabella for himself but has not had any success. The pirates decide that Isabella is the right woman for their leader. Mustafà promises to grant Lindoro his freedom and to allow him to return to Italy if he will take Elvira off Mustafà’s hands. Elvira, in turn, is still in love with her faithless spouse. The Ponnelle production is old-fashioned in the best sense. Mustafà is overjoyed when he learns of the captive Italian woman. When the ruler, dubbed “the scourge of women” by his eunuchs, meets Isabella, he is immediately smitten. On her part, she is confident she can outsmart him. When Isabella is reunited with Lindoro, they have a couple of rocky moments because naturally she thinks he is running off with Elvira. But the lovers are soon reconciled, and Isabella tells Mustafà that she wants Lindoro to remain as her servant. She also toys with the ruler, making him wait for her and then frustrates him by insisting that Elvira join them for coffee. Lindoro convinces Mustafà that Isabella desires him, but to win her over, he must take part in a ritual in which he eats, drinks, and sleeps while not paying attention to what is going on around him. The Bey revels in his plate of pasta while the lovers make their getaway. At the end, Mustafà learns what happened and good naturedly makes peace with Elvira. The opera begins with a buoyant overture, one of Rossini’s special talents. The cast is up to the musical challenges of Rossini’s music while maintaining a steady stream of laughs. Portraying Mustafà, Ildar Abdrazakov seems to be having the time of his life as the egotistical womanizer. While the bass has distinguished himself in a wide range of roles at the Met, this one reveals a flair for zany comedy. Some of his funniest moments occur when he isn’t even singing, such as his attempts to fling a bouquet into Isabella’s window. He also excels at more demanding singing, as evidenced by his challenging Act I aria, “Gia d’insolito ardore” (“An unusual ardor”). Elizabeth DeShong was originally scheduled to play the title character but had to withdraw for health reasons. The Met came up with an excellent replacement, mezzo-soprano Marianna Pizzolato. The cast is up to the musical challenges of Rossini’s music. Pizzolato has made a specialty of the part in European opera houses and is at home with the comedy as well as the deep feelings that Isabella expresses in her aria “Cruda sorte!” (“Cruel fate”). This is her debut at the Met, and she will return in Rossini’s “Guillaume Tell” in November. Another notable debut was by the romantic lead, American tenor René Barbera, who contributed some of the most impressive singing, with striking high notes. 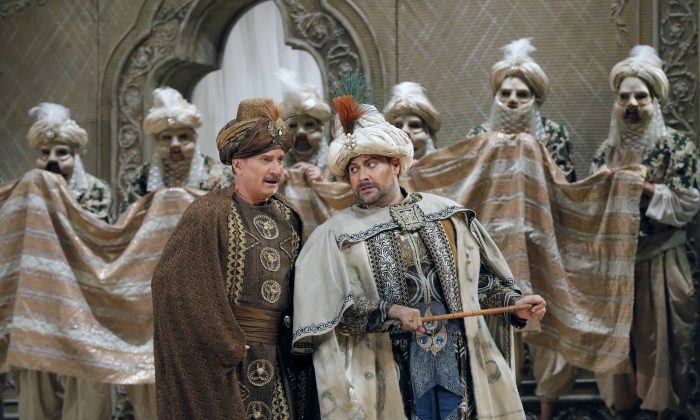 The effective supporting cast included baritone Nicola Alaimo as Taddeo, soprano Ying Fang as Elvira, mezzo-soprano Rihab Chaieb as Elvira’s slave, Zulma, and baritone Dwayne Croft as the pirate captain Haly. The Ponnelle production is old-fashioned in the best sense. It conveys the composer’s intentions without imposing a visual style that is inconsistent with the content. The packed house responded enthusiastically to the performance. Because of the colorful set, visual comedy, and bouncy score, “L’Italiana in Algeri” is also a good choice for children, assuming they are old enough to sit through an opera. The Met should consider an abridged version for its Christmas holiday performances.